ay scheme being organised by a local church with a donation towards the costs of the project. 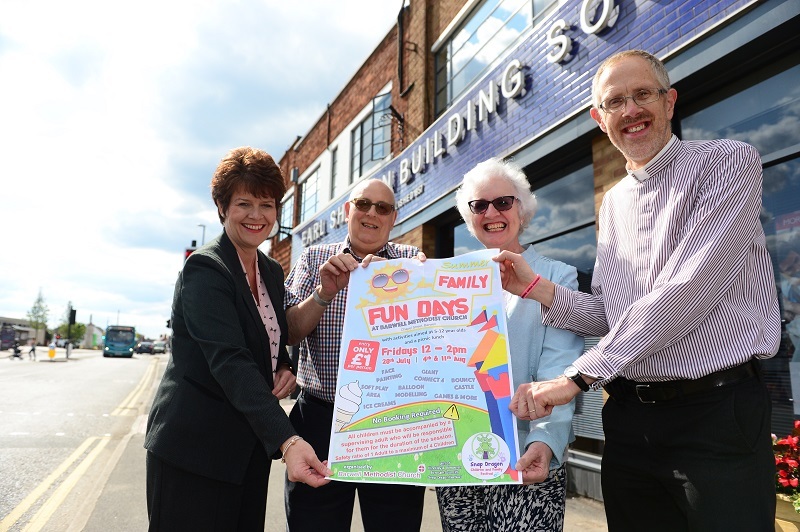 Barwell Methodist Church is planning three lunchtime play sessions with fun-filled family activities, as part of Hinckley & Bosworth Borough Council’s annual Snapdragon Family Festival. Funds from the Society, which has a branch in Barwell, will be used to cover expenses incurred in hiring equipment and providing a buffet lunch for families who attend the events. The play sessions will run over three consecutive Friday lunchtimes from 12pm to 2pm during the school holidays, on July 28th, August 4th and August 11th. A range of indoor and outdoor activities are planned, including a bouncy castle, soft play area, Giant Connect4, balloon modelling and ice creams. Activities will be aimed at primary school aged children but organisers are looking to provide something for the whole family to enjoy. David Attenborough, a former employee of the Society, is part of the group from Barwell Methodist Church organising the play sessions, alongside his wife Tricia. He said: “We’re very grateful for the generous donation from Earl Shilton Building Society, which will help to give us the financial grounding to put on three fantastic events for the local community. Paul Tilley, Chief Executive of Earl Shilton Building Society, said, “We are always keen to support community-led initiatives such as these, which play a vital role in bringing people together across the communities we serve. Earl Shilton Building Society is continuing to offer charitable funding to worthy causes across the local area in 2017, through its ‘In the community’ scheme. All types of community groups, charitable organisations, teams, clubs and schools can take part. However, to ensure the scheme remains truly local, applications will only be accepted from the following postcode areas; LE, CV9 to 13 and DE11 to 15. Full details can be found at www.esbs.co.uk/useful-info/in-the-community.